The Fed’s representatives supported USD and on the other hand strong Chinese manufacturing PMI put JPY under pressure. 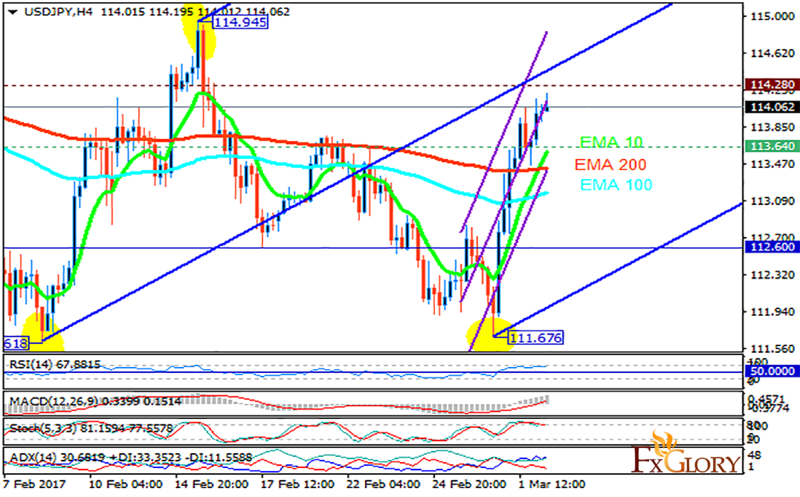 The support rests at 113.640 with resistance at 114.280 which both lines are above the weekly pivot point at 112.600. The EMA of 10 is moving with bullish bias along the ascendant channel and it is above the EMA of 100 and the EMA of 200. The RSI is moving in overbought area, the Stochastic is showing upward momentum and the MACD indicator is in positive territory. The ADX is showing buy signals. USDJPY is growing up within Andrews’ pitchfork so long positions are recommended targeting 115 level.